Beukenhorst Coffee - Supplier of the finest cup of coffee. We know what you need for the finest cup of coffee! Coffee is our profession since 1784! Beukenhorst Coffee is the right adress for professional coffee machines and the finest coffee at work or catering. Our roastery exists since 1784 and is one of the oldest in Europe! Excellence comes in a lot of flavours at Beukenhorst Coffee. Our assortment offers whole beans, ground beans for coffee filter machines, as well as ground beans for fresh-brew machines. All varieties, with the exception of the fresh brew blend, are also available in decaffeinated version, of course with the typical Beukenhorst taste. Your choice is there for sure! A coffee solution that suits your business? WMF coffee machines and Beukenhorst Coffee make it very easy! 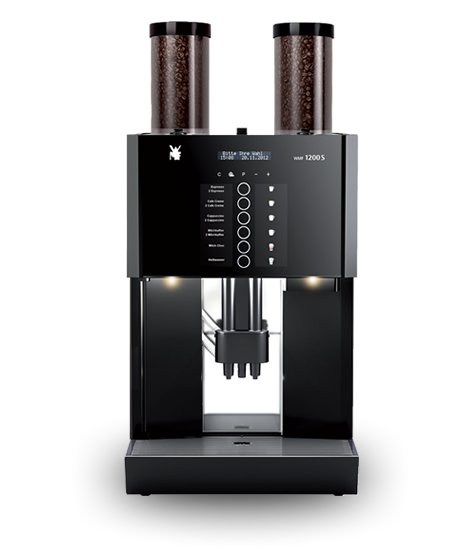 We are official dealer of the best German-made professional coffee machines. In combination with our freshly roasted beans we guarantee you the finest cup of coffee. Our roastery exists since 1784. When Albert Beukenhorst settled in Winterswijk as coffee roaster and retailer. Since then we roast the finest Arabica coffee beans through the traditional drum system. Therefore the coffee beans are given time to develop a good taste while retaining their important flavors. Slow food at its best! Beukenhorst offers you the choice of three different brands. All three are 100% Arabica blends, but differ in character and flavor. Each brand has its own identity through its unique service and matching accessories such as drip catchers, sugar sticks and milk cups. You decide which brand is best for your business. A full medium roasted 100% Arabica coffee. Ideal for catering or at work! Premium Gourmet Coffee. Suitable for a perfect espresso, cappuccino or latte! Our Fairtrade coffee with the Max Havelaar label. Quality and sustainability go well together! Try Beukenhorst Coffee for free? Copyright © 2010 Beukenhorst Coffee All rights reserved.